The Edge CTS2 Juice with Attitude programmer is perfect if you're interested in the best looking, most function, and easiest to use diesel programmer on the market. Doesn't matter if you're looking for increased fuel efficiency, you want to peel the rubber of your tires, or anything in between - this is the engine tuner for you. The CTS2 Juice with Attitude features a 5" full color, high resolution touchscreen that's displayed inside a sleek case. Each CTS2 includes OBD-II connection cable, HDMI cable, and mounting hardware. The HDMI cable makes it easy to link up power as well as your favorite Edge accessories, such as the backup camera and EGT monitor. There are performance tuning settings for increase fuel efficiency, towing, daily driving, and performance. You can see huge horsepower increases of up 180 horsepower and 440 ft/lbs torque depending on application. 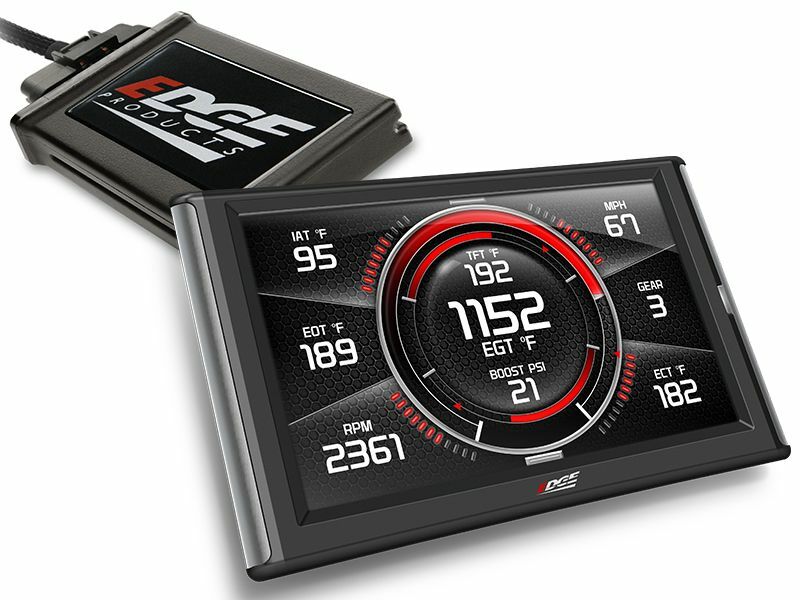 You have your choice of five custom gauge screens available to monitor vital vehicle parameters. Accessing the different features of your Edge CTS2 Juice with Attitude is simple directly from the intuitive home screen. From the home screen you can easily access the programming screen, turbo timing, PID selection screen, backup-camera screen, diagnostics manager, and much more. So, if you're thinking that you want the sleekest, most functional, easiest to use diesel programmer on the market, you've found your tuner. The Edge CTS2 Juice with Attitude diesel tuner is going to give you the ability to drive exactly how you want to drive. Edge CTS2 Juice with Attitude diesel programmers include everything you'll need to get your diesel roaring down the road. Installation is a breeze, and there will be step-by-step instructions for installation. If you have any questions, give us a call at 877-216-5446. We have people by the phone seven days a week waiting to take your call.